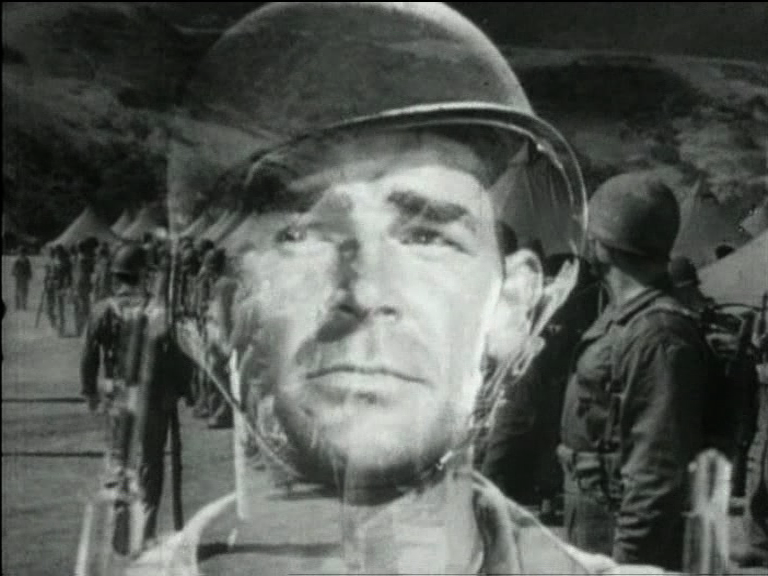 For the investigation of aesthetic patterns and compositional strategies of emotionalization through audiovisual media, the war film genre can be regarded as a prime example, because its political intention in the strategic use of audiovisual media to mobilize emotions is in most cases quite explicit and shapes the ordinary view of these films. This intention is usually suggested by the term propaganda, meaning the influence on beliefs and convictions, but crucially also the mobilization of hostility, of feelings of collective superiority, and readiness to make existential sacrifices. 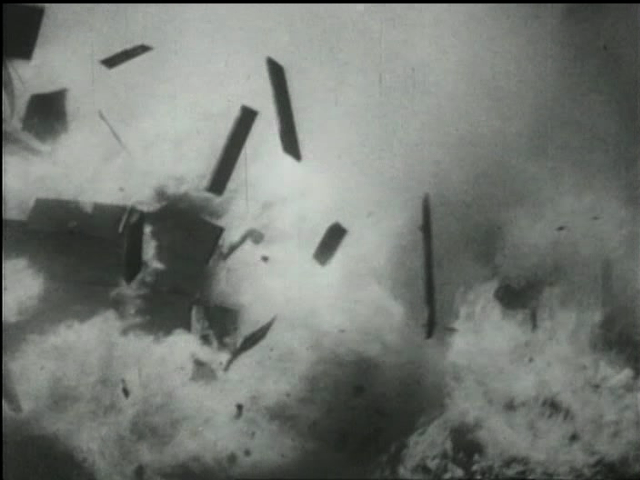 In turn, the strategies of mobilizing these emotions by orchestrating audiovisual images can be systematically analyzed and described by examining the war film genre. The aim of this article is to present a systematic approach to the film analytical description of poetic strategies that invoke emotions and illustrate it with an exemplary analysis of the film GUNG HO! (Ray Enright, USA 1943). Chapters 1 and 2 will outline the theoretical premises of this approach. After a short sketch of the method's application in Chapters 3 and 4 and after a closer look into the micro-level analysis of the approach in Chapter 5, the main focus of the article will be on the description of the dynamics on the macro-level of a film: Chapters 5 and 6 will unfold a detailed analysis of GUNG HO! 's dramaturgical operations as a poetics of mobilization. The theoretical and analytical framework of this article is informed by a research agenda that sets out to review the concept of genre poetics in general: We regard genre not as a system of taxonomy and attribution but as a mode of cultural production that is deeply intertwined with the affective cohesion of a community. One of our basic premises was to reconsider the traditional view of film genres as sets of characters and narrative situations (cf. Basinger 2003: 56-59, 67-69; Eberwein 2010: 11-13) and to develop a concept of genre as a system of shaping, addressing and differentiating emotional experience that is more than a way of organizing narrative events. We wanted to take the stereotypical generic requirements and see how they situate the spectators within a shared world of sentiment, a sense of belonging to a common world of aesthetic, emotional, and moral judgment – this shared world being not only the diegetic world of a single film or a single genre but the genre system as a dynamic whole, as a system of cultural self-understanding. This reconsideration of genre standards and stereotypes aimed at two major goals: It had to bring to light that these genre standards are always related to specific strategies of audiovisual composition. And it had to be able to make historical changes within the genre comprehensible, something a mere list of genre standards is unable to accomplish. We looked for ways to make the temporal structuring of these genre standards visible, because we assumed that it is the specific temporal structure of films and of audiovisual compositions that converts these standards into modes of a spectator’s emotional experience. The result was a concept of “pathos scenes” as the central form of shaping affect and meaning within the genre. 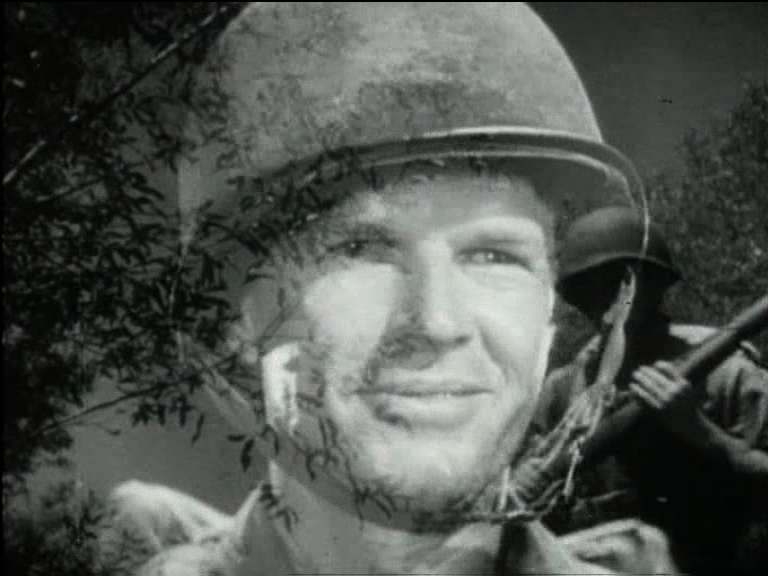 The genre of classic war films can be described through a certain number of stereotypical narrative patterns and character constellations ( standard scenes ). This includes for instance drill or combat action or acts of heroic individual sacrifices. On the other hand these standard scenes are characterized by specific compositions of cinematic forms of expression (like gesture, color and lighting, spatial and acoustic patterns, montage) that result in a particular mood. These standard scenes are strongly connected to the aesthetic strategies of mobilizing emotions and can be assigned to distinguishable realms of affect, for example mourning, fear, or rage. Therefore, these standard scenes can be defined as pathos scenes. It is the temporal structure of the audiovisual composition in a particular scene that activates the specific realm of affect as a mood. The audiovisual composition of a single scene is structured as an arrangement of temporal segments that unfold in a distinctive pattern. We define those patterns as expressive movement units. The temporal arrangement of pathos scenes within a film – their order in time – is the basic structure of the process of mobilizing emotions. We can understand this as the macro level of the war film genre's poetics of affect. Historical contexts and intentions can be deduced from the variation of these pathos scenes and their arrangements as poetics of affect. We performed several series of test case analyses using a preliminary typology of pathos scenes based upon an overview of the current state of research on the war film genre (Basinger 2003; Eberwein 2010). This first list was informed by one central premise inferred from this overview, namely that the poetics of affect in the classical war film is not based on the factual events of war or on glorifying heroic deeds but on the staging of a relationship between the individual body and the larger military corps and on the suffering of the individual. We evaluated these test analyses for relevance, redundancies and intersubjective reliability. This led us to the definition of the following eight fundamental types of pathos scenes that designate distinct realms of affect. 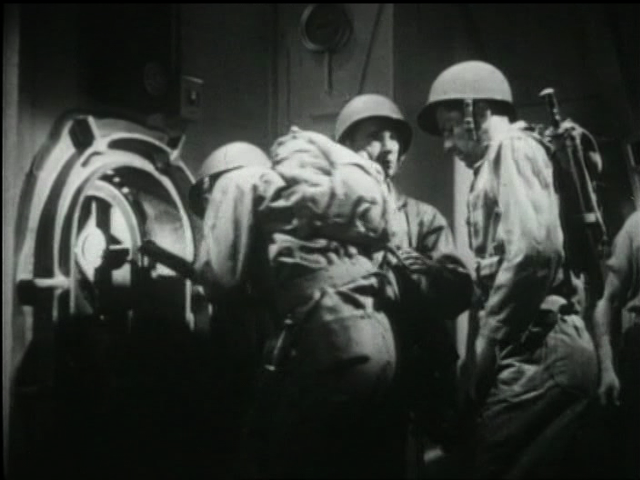 This set of pathos scenes is the core of our theoretical and analytical approach to the war film genre. These types of cinematic pathos have proven highly operable in our preliminary studies. In these studies we have found out, that the emotional impact of the stereotypical constellations is captured best not by one single realm of affect but rather by a spectrum or a field of tension between two poles. This set is also derived from the premise that the poetics of affect in the classical war film is based on the staging of the relationship between the individual body and a larger military corps. We claim that these types of narrative stereotypes and realms of affect are a useful means to make the war film genre's poetics of affect describable. These scenes are about the difference between the quotidian sociality of civilian life and the military sociality in a state of emergency, which is war. In particular, these scenes portray rituals and processes of transition, by which men and women are separated and the military is portrayed as a purely patenal structure. They realize an affective experience between moments of loss on the one hand – saying goodbye to your loved ones –, and moments of merging into a new community on the other hand. The concluding phase of the initiation process is the corporeal integration into the army. It takes place as a cinematic expression of variations of the relationship between the individual and the military body. Figuratively, this absorption has a temporal dimension, beginning with an individual physicality that explicitly does not (yet) harmonize with the group body of the troop and by showing the process of merging individual corporeality into a group body that is also portrayed as concretely physical and overpowering. Battle against nature replaces or acts as a form of portraying the battle against the enemy. Nature is portrayed as an agent of chaos. The affective dimension of these pathos scenes stems from the cinematic concept behind classical horror films: The uncertainty about that which one sees or hears, the fear of being lost, which is met by courage and the aggressive self-assertion of military control. Weapons technology and cinematic technology merge in these pathos scenes that convey an experience of almightiness and the individual desire to become one with this infinitely powerful entity of the technological body of the military. A specific form of pleasure that derives from allowing the viewer to experience and enter the space of a filmic battle, rockets and grenades without getting as much as a scratch. These fantasies of omnipotence however threaten at all times to flip into an image of being overpowered. Focusing on leaving the social foundation of military order, these pathos scenes are always an expression of some relation to memory and the comforting longing for civilian sociality. The presence of absent moments and attributes of pre-war, daily life is often induced by media performances and temporary relapses from military discipline. This comfort can give way to an exhaustion caused by afflictive experiences and the continuous painful disassociation from civilian society of those who return home. The motif of suffering and dying appears in three variations: the victim, the sacrifice, and the scene of suffering. The image of the victim is a becoming aware of vulnerability and mortality, usually expressed as an unexpected moment of death. The sacrifice connects the soldier’s death, portrayed as the death of a hero, to a greater cause - the army, or the nation. Also, funeral rites are related to a renewal of the community. The scene of suffering focuses on an individual which experiences itself as a vulnerable and mortal body. The inside view of an indissoluble, irreconcilable experience of agony characterizes the central pathos of the war film genre. When soldiers (re-)adopt a moral, judgmental attitude, this is expressed by reactions to injustice and humiliation experienced within military structures – as a figuration of either rage or feelings of guilt. The specific emotional sensation articulates an individual, subjective experience as a moral relationship to the societal forms of the military and the nation. At first sight, these pathos scenes are defined simply by the integration of documentary material into fictional plots. But what they create is a specific relationship between the film and the spectator as a form of appellation that is beyond narration and character constellation and is directed at the viewer’s memory. Both documentary and fictional footage — edited into a dense audiovisual figuration — aim at the corporeal presence of the viewers, promoting a sense of community that develops through the cinematic expression of a shared memory of collective suffering. 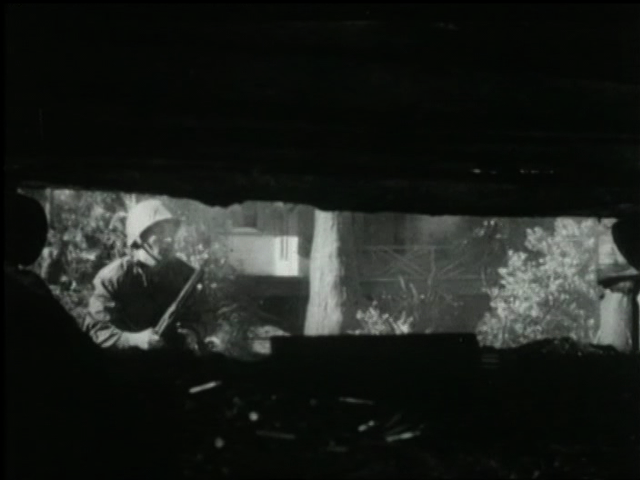 Within these pathos scenes of the classic war film genre, one can find traces to other cornerstones of genre cinema: the pleasure of fear from horror films and the thrill of unleashed material energy from the action genre, the pride in the foundations of one's nation from the western and the sentimental enjoyment of empathy and suffering from the melodrama. Thoroughly reflected, these affiliations will reveal a fundamental quality of the phenomenon of genre poetics: It only makes sense in the plural, as a system or a range of sensual and emotional registers that constantly intersect and ramify and thus form an experience of historicity. However, in the following we will not go further into the details of the theoretical and film historical implications of our approach, but will instead focus on its application to a specific film example. Our set of pathos scenes is designed to serve as a tool. It is not simply a checklist because it is central to analyze pathos scenes in their specific temporal arrangement and constellation within a single film as a process of evoking and shaping emotions, as a poetics of affect. We systematically identify and compare the variation and arrangement of pathos scenes within the genre and its history. 2. how the temporal arrangement of pathos scenes makes a film graspable as a mobilizing poetics of affect. 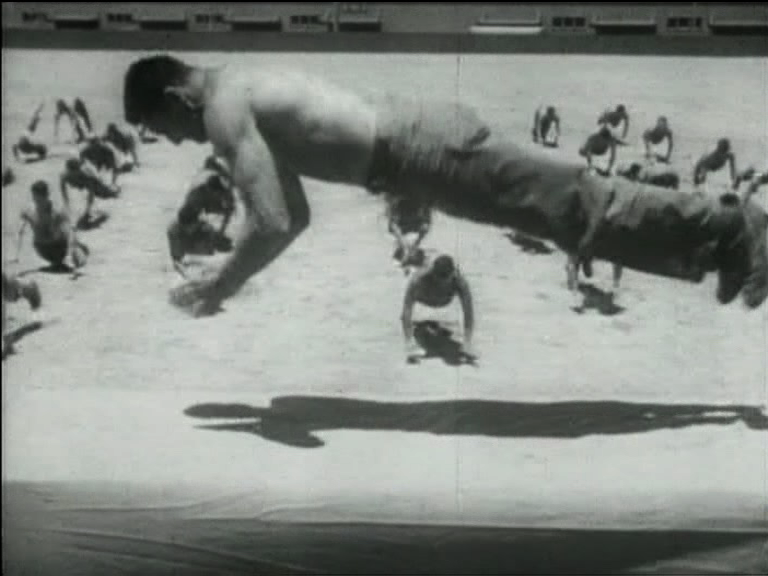 The "formation of a group body (corps)" in GUNG HO! We want to begin by introducing the concepts and methods of our systematic method with a short example of a pathos scene. 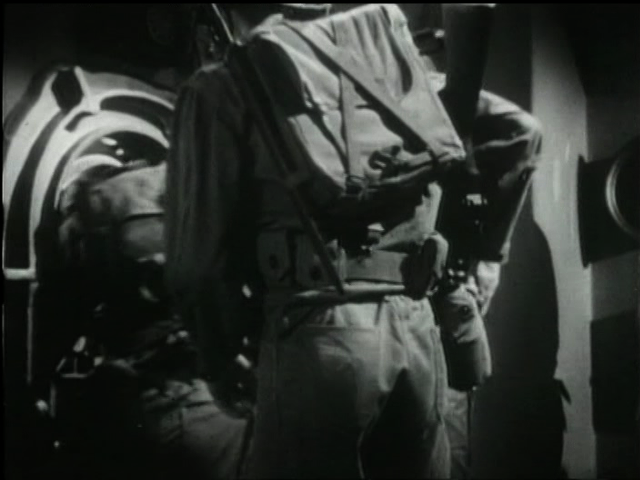 This scene of about 2 1/2 minutes duration is from GUNG HO!, which can be regarded as paradigmatic for the classical war films that were produced immediately after the United States entered World War II. Clip 1: GUNG HO! (Ray Enright, USA 1943), Min. 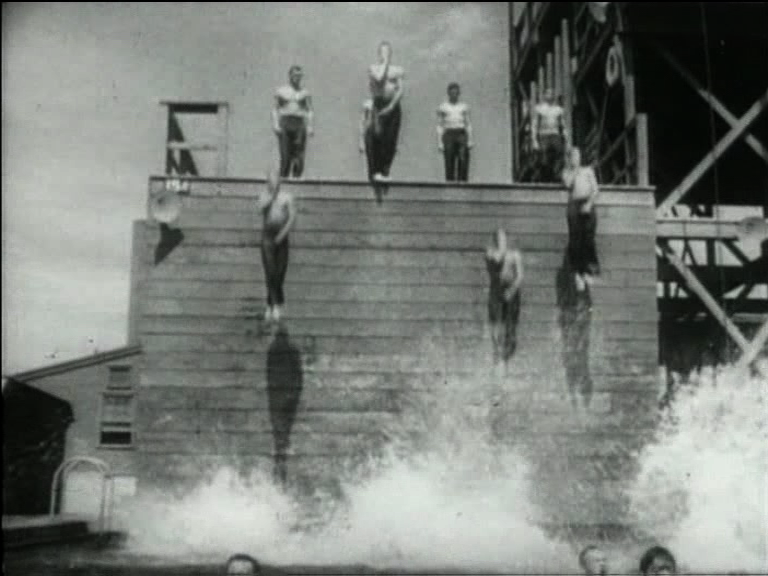 34:56 - 37:32.
a) Individual bodies are emphasized in their concrete corporeality. They are visible only as fragments, gleaming with sweat. This staging of physical proximity is heightened by a moment of sudden fear. b) These fragments of bodies, however, are united in the end in a celebrating community. There is a temporal dimension, that establishes this community's integrity as originating from these fragmented bodies. c) The scene furthermore assembles this military community around one of the group's explicit father figures, qualifying it as a paternal structure. Apart from the physical confinement, the community is established as a sociality of its own, mirroring structures of civilian live. d) Finally, the structural mirroring of civilian society is continued via a temporary return to civilian live in the mode of memory, and re-enactment. This community is gathered through an act of performing a decidedly civil ritual: the birthday party is a temporary relapse from military discipline. In this manner we proceed to identify the scenes of a film as instances of pathos scenes. The next step is to make the whole structure of a film describable and portrayable as a process of evoking and shaping of emotions. 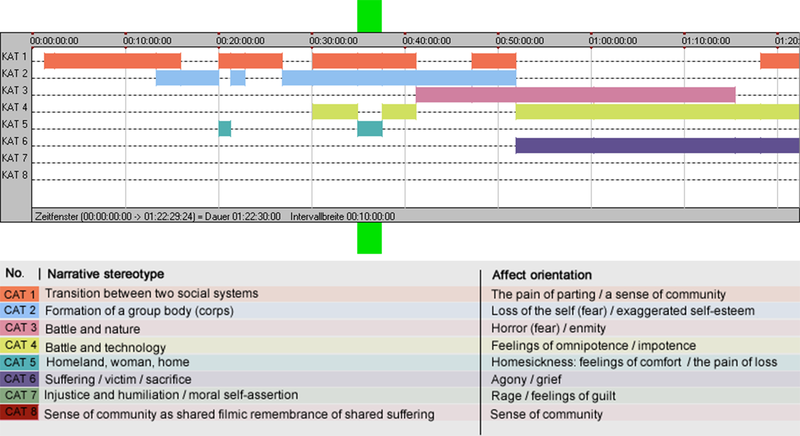 In order to visualize the structural principle and the temporal whole of the film, which the spectator traverses, we devised a simple schema to produce diagrams as transcriptions of the temporal unfolding of pathos scenes. Each diagram represents a single film’s macro level of the poetics of affect. By comparing these diagrams we can recognize the re-occurring patterns. The degree of variances of the patterns indicates the different historical variations in the war film genre. From left to right you see the temporal distribution of the pathos scenes over the course of the film GUNG HO! (fig. 1). The colored boxes represent the categorical classification of scenes; each line belongs to one type of pathos scene. The size of a scene's column is determined by the actual length of the film scene. As you can see - marked in green - our exemplary scene is situated at about 35 min. and is characterized as a constellation of three types of pathos scenes: Transition between two social systems, Formation of a group body (corps) and Homeland / Woman / Home. An individual pathos scene does not only represent a certain activation of realms of affect as a concrete unfolding of audiovisual expression, it is also a temporal transition state within the film. One general observation is, that the pathos scenes do not have a simple linear order as much as they build clusters of variable alignments and are repeatedly renewed through the film. Which means, while the pathos scenes remain recognizably distinct categories of emotional and cinematic experience, they are often combined in complex alliances within single scenes. and where they cease to appear in the film. For instance, scenes of moral injustice and scenes of filmic remembrance do not appear in GUNG HO! - so one can already clearly presume, what this film is not (yet) about: the critique of military structures and the commemoration of lost lives. What becomes evident on a first glance at the diagram of GUNG HO!, is that this arrangement makes clearly recognizable the three-act-structure of the film. It shows that we can provide an account of the way dramaturgical structures are paralleled by structures of emotional experience. Fig. 2: Temporal arrangement of pathos scenes in GUNG HO!, emphasizing the first act. 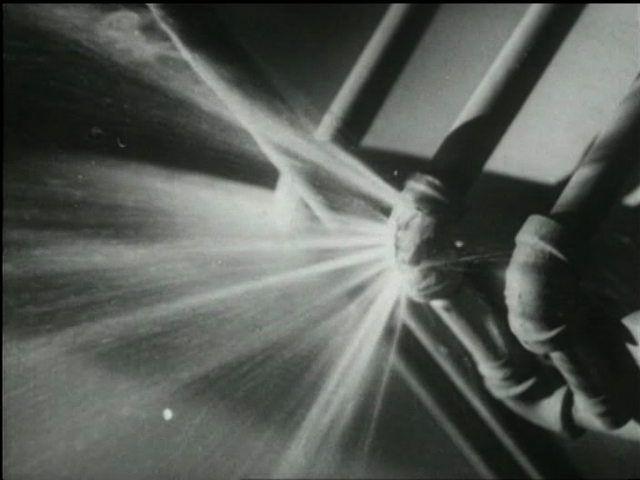 The first act of the film (Fig. 2) concerns itself with the process of initiation: from the separation from a civil existence to the re-integration into a different social life form, the incorporation of men and boys into the corps, that is into a world where the feminine is absent. It starts with a frontal address by a superior and an extended scene of individual recruiting (see Ch. 6). What follows is the adaptation of bodies into one corps as the audiovisual experience of dynamic geometry, where the movements of individuals are directly interwoven with one another. This is paralleled with the experience of what is lost in this process – the woman, the everyday life – and what is gained – a new identity, a new family with Randolph Scott as the understanding and unerring father. Fig. 3: Temporal arrangement of pathos scenes in GUNG HO!, emphasizing the second act. The scene we have presented at the beginning of this chapter will also be analyzed in the following. It appears in the second act (Fig. 3).This act is characterized by being entirely set in a submarine. The submarine is less a narrative tool or setting; the way it is staged cinematically becomes a means of showing how merging into the larger corps goes along with losing control over your own body and self. Fear and claustrophobia are introduced by the pathos complexes of an overpowering technology and the fear of losing the coherence of one’s identity. The scenes of the second act create a repeated structure of escalating affective ambiguity, fear and terror only to retract them with forced humor, calming music, demonstrative sovereignty of the superiors and images of collective harmony. Fig. 4: Temporal arrangement of pathos scenes in GUNG HO!, emphasizing the third act. The affective and narrative patterns that structure the first two acts are strikingly absent from the third act (Fig. 4). This indicates that the contradictions between individuality and military sociality, body and corps are resolved in favor of the latter. The dimensions of fear and the dissolution of boundaries that were introduced before are now exclusively applied to the experience of the battle. The horror is no longer a question of losing one’s self in the corps but it is a manifestation of the enemy. The dissolution of boundaries is unambiguously enjoyed as a frictionless fusion of man and weapon, as the working of the military machine. 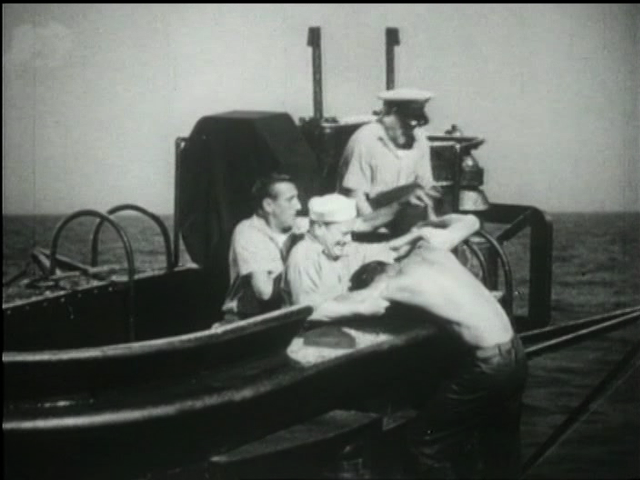 Before we analyze this three-act-arrangement of pathos scenes as a temporal structure of mobilization, we will present a short analysis of the scene "Group body in the submarine." It will serve as an example for the way we deduce the affective quality of a scene by its audiovisual composition as a temporal unfolding of a spectator's experience. First, the aesthetic strategies and patterns in audiovisual media have to be conceived of as ways to create specific temporal structures, a cohesive temporal gestalt of audiovisual movement. Second, the point of realization of these temporal structures is the embodied perceptual and affective experience of the spectator. Third, it is necessary to describe these temporal structures – taken as a whole – as a process of creating and shaping emotions, a process that can be revealed on the concrete level of strategies of cinematic staging. 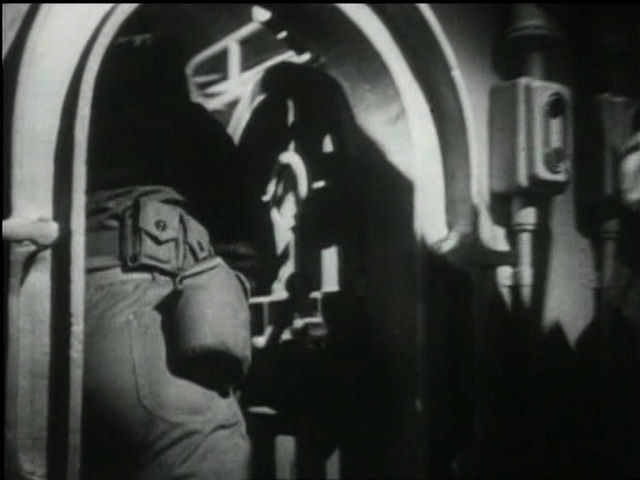 In the case of the scene "Group body in the submarine," we are dealing with a compositional logic of 'mirroring'. In the formal interplay of camera and editing, this scene superimposes the image of concentrated readiness for battle with the ambivalent echo of death. The ambivalence between the thrill of killing and the realization of one's own vulnerability is finally resolved in the family-like structure of the military community. 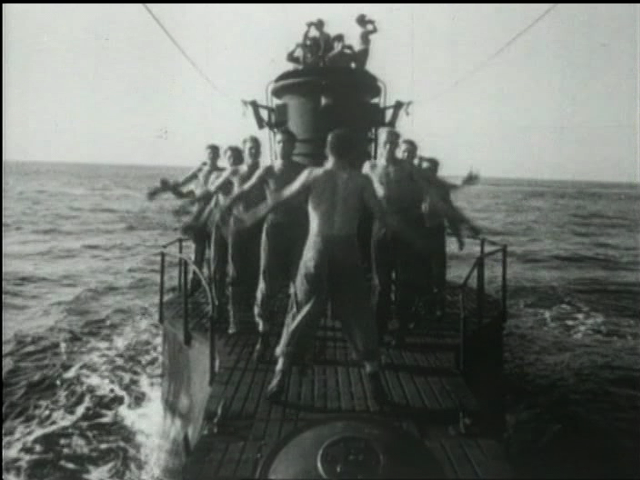 In the film’s dramaturgical structure, this scene is between the soldiers’ arrival in the confinement of the submarine and the initiation into the collective desire to fight. The two narrative events - the theory and practice of knife attacks and the birthday party - are correlated by a similar temporal structure and certain principles of mise-en-scène and editing. In both cases a carefully unfolded image of a distinct atmosphere is interrupted by a surprise factor from off-screen. Whereas a latent atmosphere of aggression and bellicosity is turned over into sudden fear in the first half, in the second half it is a sense of gleeful anticipation that is flipped into a moment of joyful enthusiasm. In both cases the condition into which the elements of surprise finally stabilize is an image of conviviality and of a secure and comforting sociability of male cheerfulness. 1. The unfolding of a tense and crowded visual composition. The soldier's gazes are focusing on the knife. As they pass it around, it is kept in the centre of the frame. Fig. 5: Still from GUNG HO! (Ray Enright, USA 1943), Min. 36. 2. A sudden cut and a sudden movement from off-screen coincide. One of the soldiers is trapped; his body is twitching and jerking. Fig. 6: Still from GUNG HO! (Ray Enright, USA 1943), Min. 36. 3. Slowly, this tension is then eased by a long static shot. As the superior from above playfully threatens to demonstrate his skills again, the individual soldier is liberated from the tight framing - laughter bursts out . Fig. 7: Still from GUNG HO! (Ray Enright, USA 1943), Min. 37. Fig. 8: Still from GUNG HO! (Ray Enright, USA 1943), Min. 37. 1. The perspective depth, emphasized by a movement towards the foreground and by lateral pans and movements, establishes the image of an overwhelming density of bodies. Fig. 9: Still from GUNG HO! (Ray Enright, USA 1943), Min. 37. 2. Sudden movements from the edges of the image, from off-screen and from the background reach towards the centre and the foreground. Fig. 10: Still from GUNG HO! (Ray Enright, USA 1943), Min. 38. 3. A mass of happy faces, joking, singing, framed in a long static shot. The relation between the two mirrored parts of the scene is encapsulated in the - literally - central objects of the two parts: it is the movement from the knife to the birthday cake, from physical tightness to communal closeness, from the physical body to the ideal, symbolic body. This scene designs the military community as an antidote to fear and as a surrogate sociality. The issue, however, is not only the semantic content of this design or the mere fact that the scene uses a common abstract pattern of composition, but the way both content and abstract pattern are unfolded and generated audiovisually as a cohesive gestalt of expressive movement (cf. Kappelhoff/Müller 2011). Clip 2: GUNG HO! (Ray Enright, USA 1943), Min. 34:56 - 36:04. Through the interaction of camera and editing an ambivalent audio-visual blend of concentrated readiness for battle and the reverberations of the fear of dying is realized. Like a prologue, an animated map situates the submarine both topographically and, by the name of the home port, Pearl Harbor, historically. 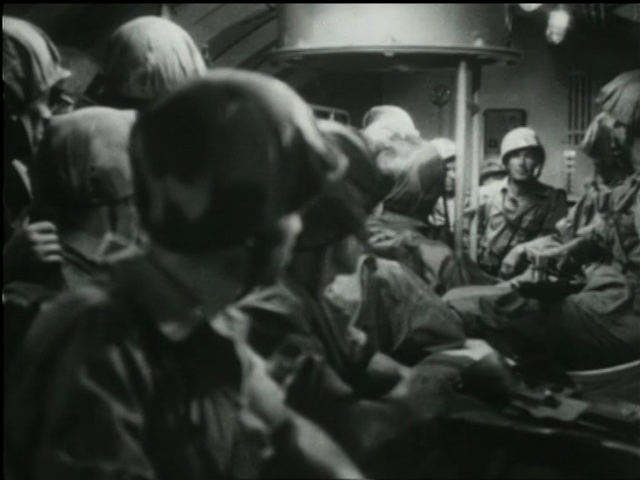 The two shots that follow create, through a camera pan, a five-person talk session that pushes the soldiers’ bodies closely together in the frame. The dark shades of grey and the somber content of the discussion—how to best stab the enemy—create an atmosphere of being physically beleaguered. Gradually this atmosphere is intensified and momentarily becomes an actual threat by the Lieutenant's sudden stranglehold from off-screen. The projected one-on-one fight that culminates in a simulated thrust of the knife, lively facial expressions and changing light intensity creates an ambivalent mix of actual threat and the playful transformation of fear. Not until the second cut to the Lieutenant are the soldiers’ bodies freed from the close framing of the image. 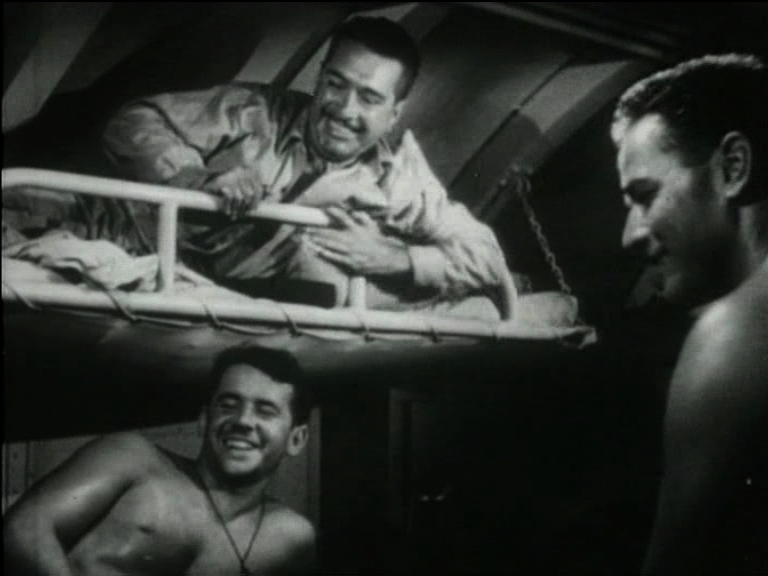 A small joke cleanses the preceding projection of a one-on-one fight from its frightening elements and at the same time creates a transition to a relaxed togetherness of the soldiers. 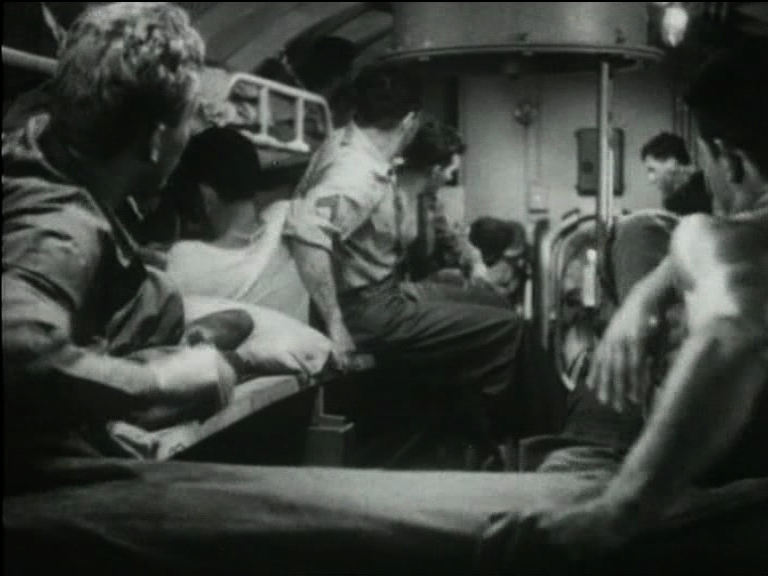 After another view of the submarine, the first cut reveals the entire space of the soldiers’ sleeping quarters. 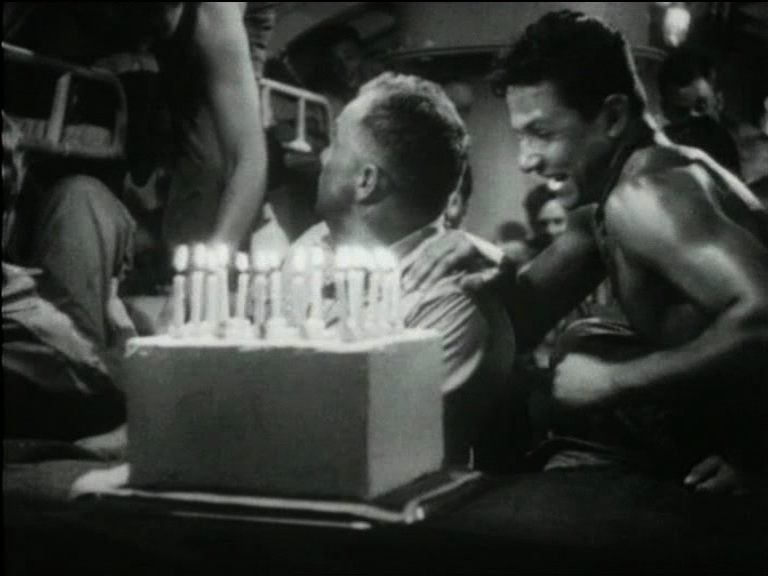 The next cut follows the birthday cake being carried in with a long pan through the entire cabin. 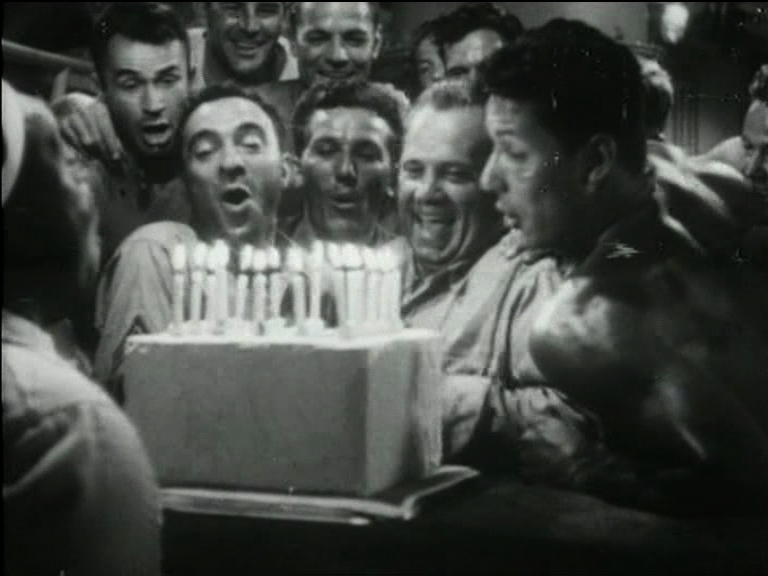 Still supported by dark shades of gray and absolute quiet, a shot/reverse shot establishes a relationship between a single soldier and the celebrating group. In this sequence of shots the cake is placed at the frame’s vanishing point. The simultaneous continual reduction of the depth of field anticipates a moment of visual static: a standing image of a family-like get-together. The final prolonged shot begins with all the rest of the soldiers plunging tumultuously into the frame. Their faces have happy expressions as the huddle together in the foreground of the image. Clip 3: GUNG HO! (Ray Enright, USA 1943), Min. 36:04 - 37:32. In this sudden turn of the staging, the confinement which was shown in the first part of the scene as spatial distress is now revalued as a quality of social bonding. Since, in terms of visual composition, the lit cake is at the center of the scene, an excess of high intensity light is created that strengthens the relaxed image of a family-like military community even more. In both expressive movement units of this scene we find the same principle: an unstable situation of expectancy is interrupted and a different, stable situation is established. It is in this sense, that one can say that the "gesture", which this scene performs, realizes the relationship between the individual body and the group body as a self-stabilizing system. The object of the spectator's embodied experience is this system's power to transform fear and claustrophobia into a sense of comfort and belonging. Our method allows us to describe systematically the three temporal levels of the way that classic Hollywood war films modulate the emotions of the spectators: compositional micro-structures, scenic compositions and dramaturgical arrangements. In order to emphasize this argument, we want to conclude by analyzing the dramaturgical arrangement of pathos scenes in GUNG HO!. By applying our method we can show how the emotional course of GUNG HO! is identical to a propagandistic message of mobilization. As mentioned before, we consider the three-act-structure of the film to be quickly recognizable: The first act consists of intertwining the patterns of the initiation into the army: the transition from the civil society and the formation of a group body (Fig. 11). Fig. 11: The temporal arrangement of pathos scenes in GUNG HO!, highlighting the first act. Fig. 12: Still from GUNG HO! (Ray Enright, USA 1943), Min. 2. 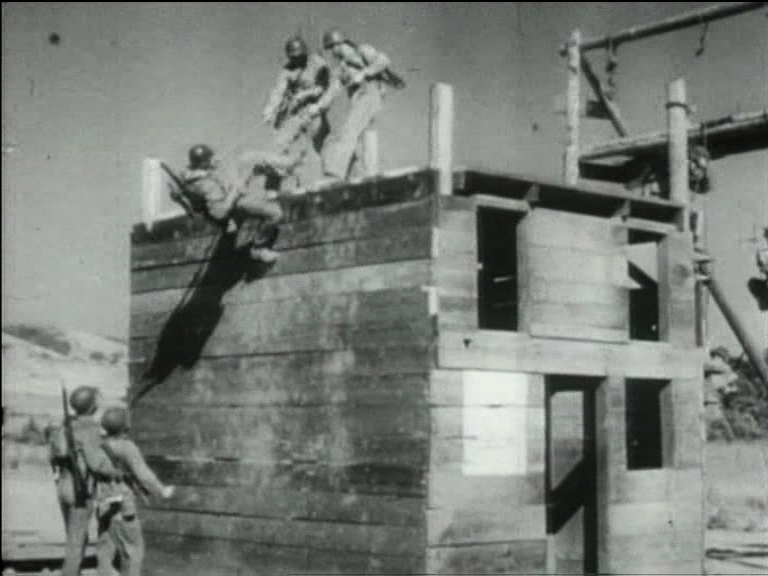 This is followed by an extended sequence in which individuals are recruited for a special battalion (Figs. 13-15). It presents characters from different social backgrounds who are at the same time easily identifiable as characters from different cinematic genres. They are united by the same compositional pattern of mise-en-scène and editing that is repeated with every candidate. Figs. 13-15: Stills from GUNG HO! (Ray Enright, USA 1943), Min. 3, Min. 4, Min. 11. A sequence of repetitive recruiting-scenes that lasts roughly 11 minutes. 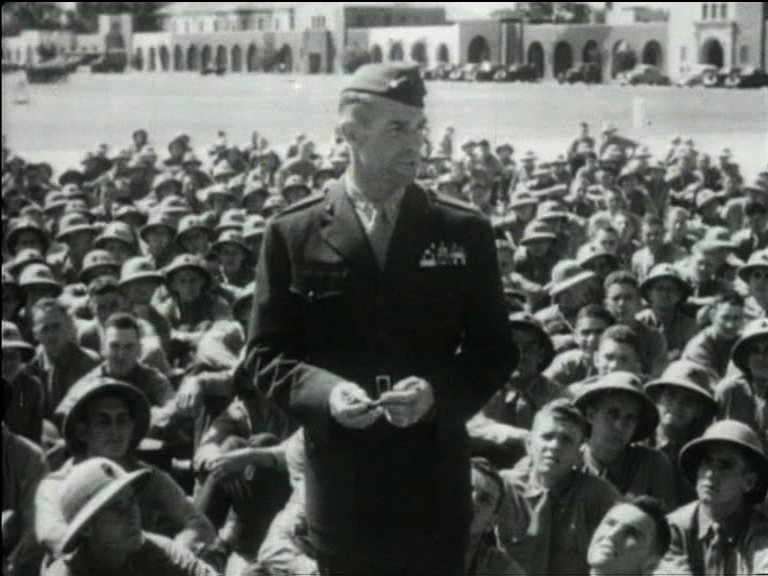 The leader of the corps (Randolph Scott) is followed by a dynamic camera movement and abruptly meets the corps as a geometric formation, as a square of human bodies standing erect in the glistening sunlight (Fig. 16). This formation is quickly resolved, the recruits not only are 'at ease', they are even allowed to sit on the ground and smoke. The leader moves into this amorphous pack (Fig. 17), emphasizing his position as primus inter pares, as the (militarily) first among (politically) equals. The regularity and symmetry of camera movement and editing emphasize his calmness and sovereignty, relating him to the regularly interspersed close-ups of individual recruits who are looking up to him. The merging of the individuals into one group, that combines and transcends the capacities of each as a necessity, begins under this premise or rather promise and is met with jubilation (Fig. 18). An invigorating speech is rounded up by the battle cry "Gung Ho!" Figs. 16-18: Stills from GUNG HO! (Ray Enright, USA 1943), Min. 14, Min. 15, Min. 16. Before the formation of the group body as a temporal process can begin, any previous order has to be annulled: the geometric formation is dissolved, the merging of the individual bodies is not accomplished yet. The merging of individual bodies into one group body is achieved in the drill-scene (Figs. 19-27): through the interaction of strictly geometrically composed images, dynamic montage and sound design. An image of a masterful, collective military body develops. Figs. 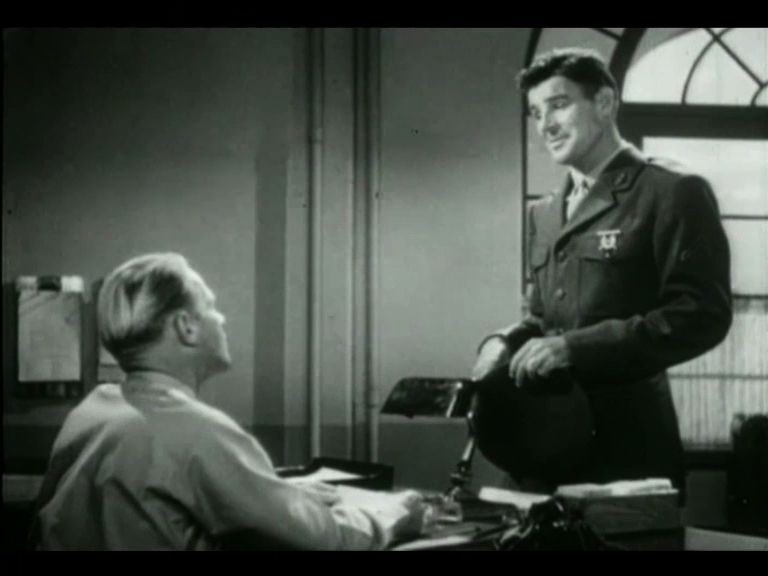 19-27: Stills from GUNG HO! 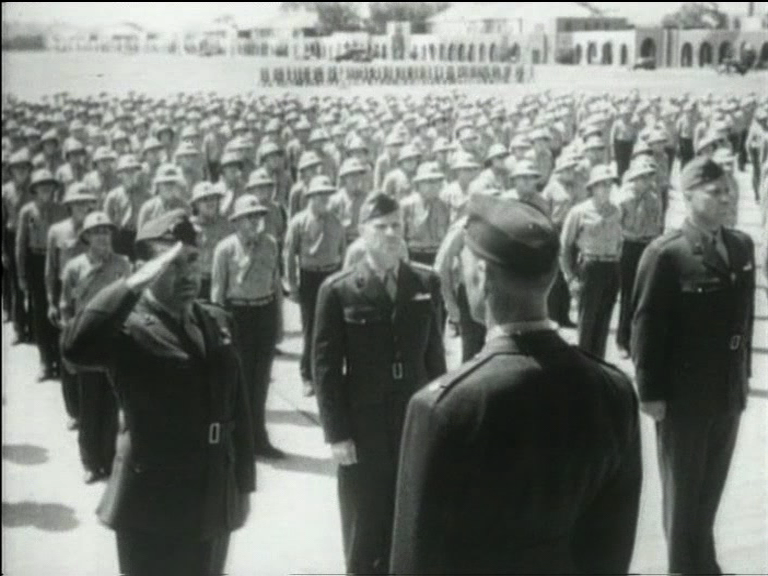 (Ray Enright, USA 1943): The ritual of drill, Min. 17-20. Rigid visual compositions and a dynamic rhythm of editing interweave the movements of individual bodies. Finally, the framing takes the soldiers out of the communal body and presents them individually. The individual body is repeatedly inserted in audiovisual projections of the experience of pain - like tripping into barbed wire (Fig. 24) or being stabbed by a bayonet (Fig. 25). Music and voice-over alleviate these potentials of individual pain and suffering and superimpose a transcendental meaning, just as the image then superimposes the individual faces with the collective machinery (Figs. 26 and 27). In the scenes following the drill, two aspects of the transition between two social systems are interwoven with the strengthening of this group body: On the one hand, we have motivational speeches by the team leader. On the other hand, we have scenes depicting the separation of men and women. However, the comic dimension of this separation, caused by the numerical mismatch between one girl and two competing boys negates any painfulness on the side of the spectator's emotion (Fig. 28). Not only does this comic mode potentially affirm the process of separation. By saying 'It is all right, at least one of them will surely come back', the comic mode also comforts those who are left behind in an almost cynical way (as if it didn't matter, which of them would come back). Fig. 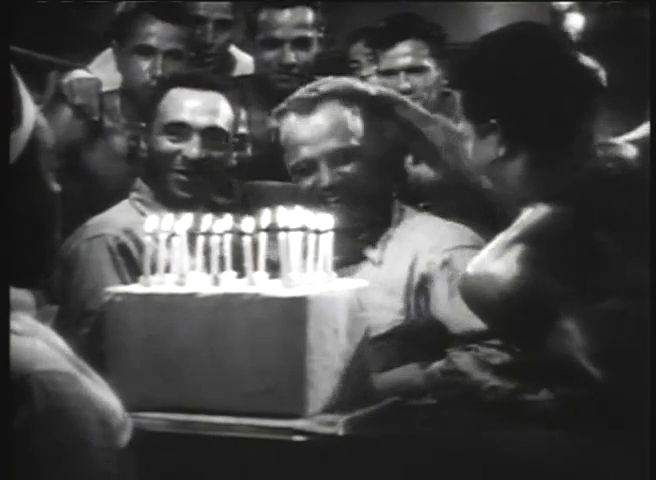 28: Still from GUNG HO! (Ray Enright, USA 1943), Min. 27. The comic conclusion of initiation: Saying goodbye to the girl, twice. During the second act, the focus shifts between two continuously present aspects (Fig. 29): First, there is the quantitative shift from "processes of transition and initiation" (CAT 1: orange) to affective and compositional patterns of the "formation of the group body" (CAT 2: blue). And second, there is a shift within the inherent tension of this formation's pattern - from the geometric, dynamic group body back to the concrete corporeality of the individual and its sense of losing itself. Fig. 29: The temporal arrangement of pathos scenes in GUNG HO!, highlighting the second act. 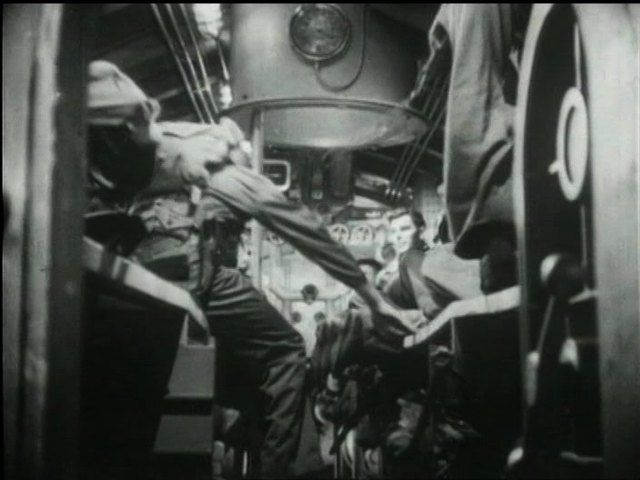 The second act is characterized by being entirely set inside a submarine. Rather than a narrative tool or setting, it is a means to show how merging into the larger corps goes along with losing control over your own body and self. Comparable to a sonata form, the film uses this as a development and continuous variation of a theme, the tense physical relationship between the body of the individual and the collective, and for the gradual introduction of quite another key: fear and claustrophobia. What we see in the course of the scenes are mostly body parts, fragments of half-dressed sweating bodies arranged in boxes like the organic overgrowth covering a mechanic skeleton. This is something quite different to the interweaving of bodies in the drill sequence. Figs. 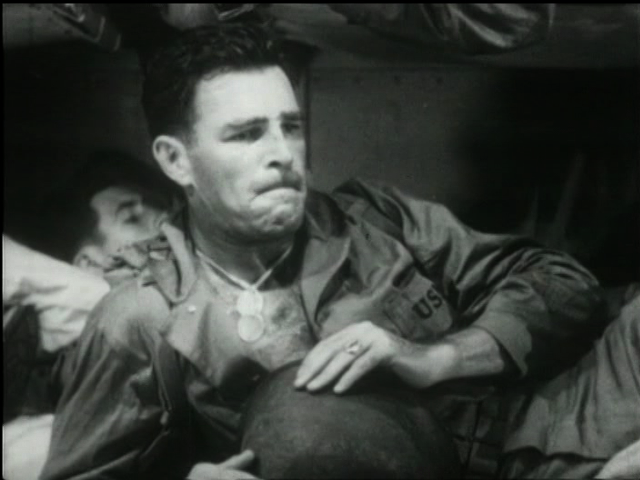 30-33: Stills from GUNG HO! (Ray Enright, USA 1943), Min. 31-32. A paradigmatic visual pattern of pushing bodies into more and more reduced space, as through a funnel. The experience the film conveys is this: How does it feel to be a piece in someone else’s Tetris game? This experience is then staged in the facial and bodily expressions of the characters as a claustrophobic fear. The increasing narrowness of space on the level of shot compositions and an editing rhythm that resembles a heightened pulse rate produce fear as a physical condition. Clenched faces, panicking bodies reproduce this condition as body-images, with the film gradually focusing on a single character (Figs. 34-36). Figs. 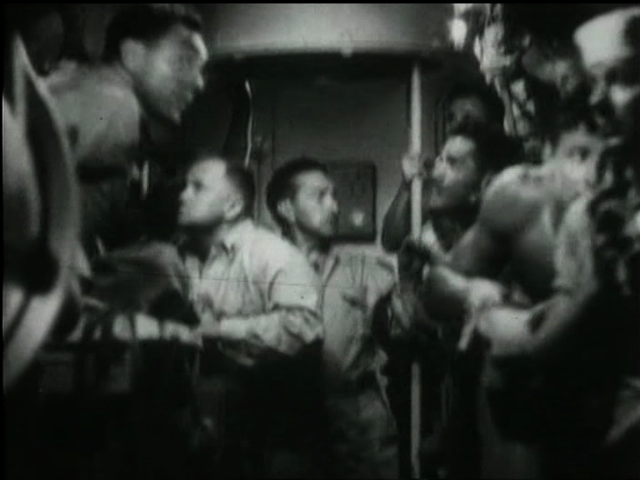 34-36: Stills from GUNG HO! (Ray Enright, USA 1943); Min. 33. Claustrophobia and the collective: The fear of losing one's self and the revaluation of "closeness". This fear is retracted with relaxation and harmony, using humorist dialogue and calming music, in a manner similar to the scene we have analyzed in Chapter 5 (Fig. 37). The transformation of physical tightness into a communal closeness is - without any exception - typical for every scene of the second act. Another crucial scene in the second act concentrates again on the character who had the claustrophobic fit in the beginning (see Figs. 34-36). Here, it is his exhaustion that separates him from the geometry and dynamic movement of the group. As the approach of Japanese fighter planes forces the submarine to dive, he is forgotten outside (Figs. 38 & 39). Fig. 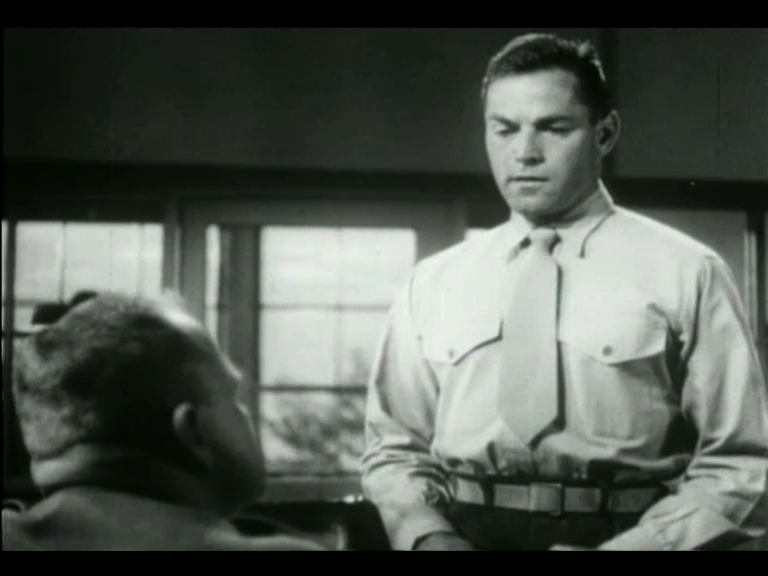 37: Still from GUNG HO! (Ray Enright, USA 1943), Min. 37. In the nick of time, and by putting the whole group at risk, this individual soldier is rescued. The geometry and the tightness of the group body are transformed from a suffocating, fearful entity into a place of security and mutual care: no man left behind (Figs. 40 & 41). 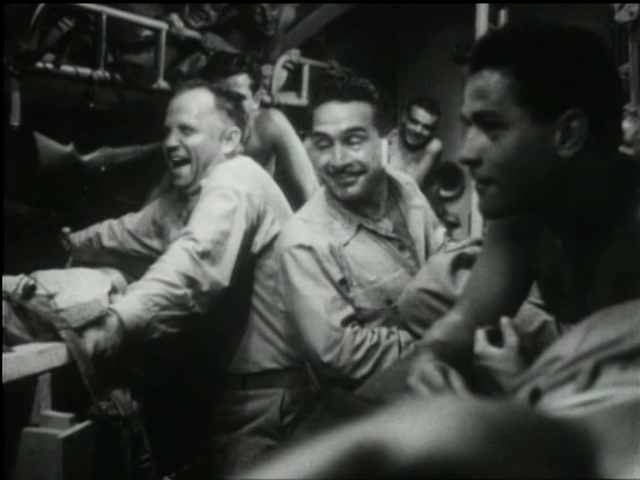 Afterwards, the rhythmically complex audiovisual composition of explosions and the rocking and shaking of the submarine leads to a unification of the individual soldiers' faces as they move from being afraid, each for himself, towards laughing and feeling secure together (Figs. 42-45). Figs. 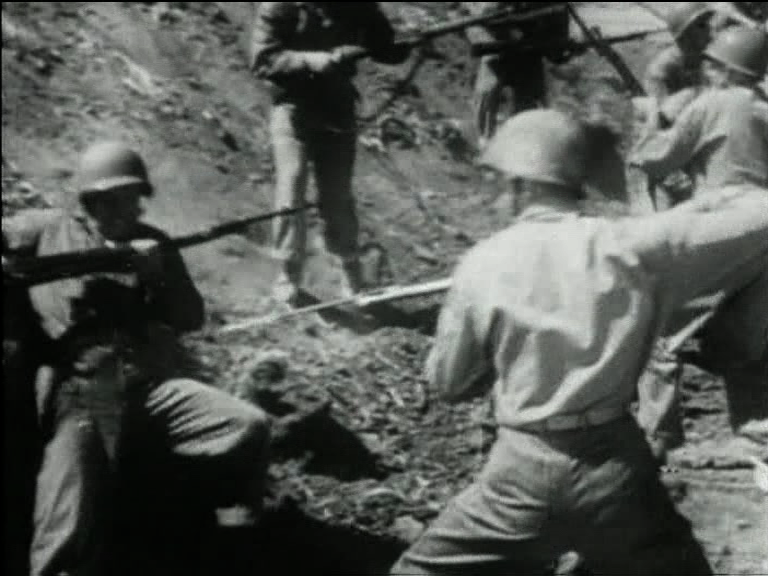 38-45: Stills from GUNG HO! (Ray Enright, USA 1943), Min.42-48. All scenes of the second act create a repeated structure of escalating affective ambiguity, fear and terror only to retract them with forced humor, calming music, demonstrative sovereignty of the superiors and images of collective harmony. This tension of escalation and neutralization is accrued through these repetitions. The cohesiveness in the sense of a physical force, holding the collective together, is thus strengthened. At the end of the second act, all this accrued tension and energy is released in a readiness to fight. 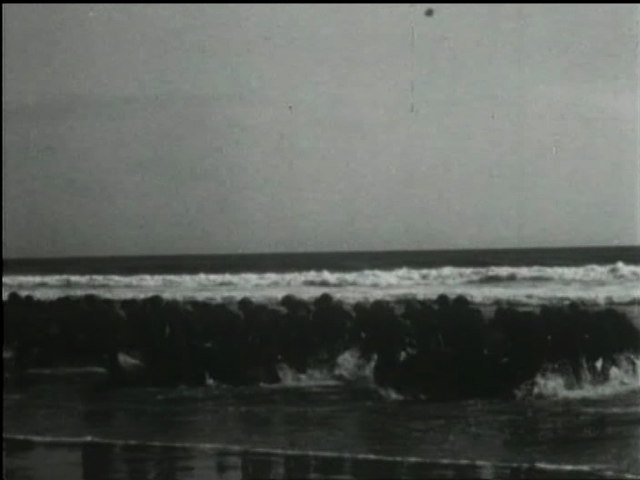 The group expands visually from the tightness of the submarine into the vastness of the beach (Figs. 46-48), like a cavalry from the western genre expands from the fort into the prairie, pushing the frontier further out. Figs. 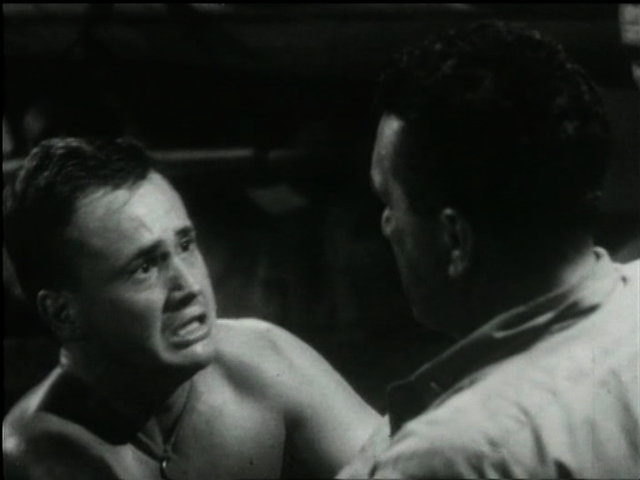 46-48: Stills from GUNG HO! (Ray Enright, USA 1943), Min. 49, Min. 50, Min. 51. The affective and narrative patterns that structure the first two acts are strikingly absent from the third act (Fig. 49). This means that the contradictions between civil individuality and military sociality, body and corps are both resolved in favor of the latter. Fig. 49: The temporal arrangement of pathos scenes in GUNG HO!, highlighting the third act. The extend to which the "formation of a group body" is concluded is especially evident in the two long combat scenes (Min. 51:57 - 75:30): The affective dimensions of fear and the dissolution of boundaries that were introduced before are now exclusively applied to the experience of the fight. The dissolution of boundaries is unambiguously enjoyed as a frictionless fusion of man and weapon, as the ecstatic perceptual experience of the military machine (Fig. 50). The horror is no longer a question of losing one’s self in the corps but it is a manifestation of the enemy - as in this point-of-view-shot (Fig. 51). In GUNG HO! war looks like American Football. And it ends with a fireworks (Figs. 52 & 53)! Figs. 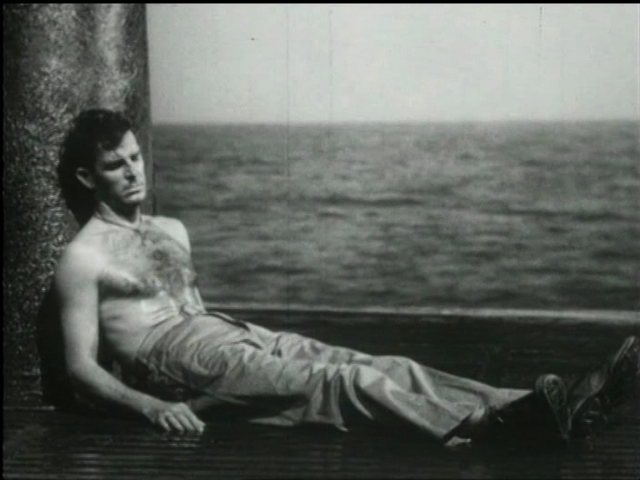 50-53: Stills from GUNG HO! (Ray Enright, USA 1943), Min. 56, Min. 59, Min. 69, Min. 80. The war looks like American Football... except that some soldiers eventually do die. But their deaths are orchestrated as heroic deaths. Which means that the melodramatic momentum of suffering and pain, of the subjective realization of mortality (Kappelhoff 2006) is counteracted just like the complex of fear is counteracted in the second act. 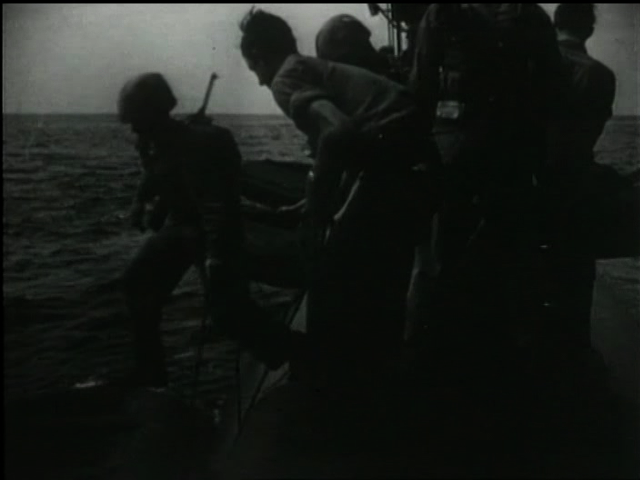 Through the interplay of camera, shot composition and sound design, the scene of „Departure and evacuation“ – which comes after the last combat action has concluded - connects three variations of an identical series of events (moments of rest, receiving orders, departure) to an image of the cyclical order of events. Clip 4: GUNG HO! (Ray Enright, USA 1943), Min. 75:30 - 78:15. The troop loses individual soldiers because they fight. It tirelessly continues the fight because of the heroic sacrifices already made. The remembrance of fallen war heroes and the intensity of contemplation is transformed into increased sovereignty of the acting military body. 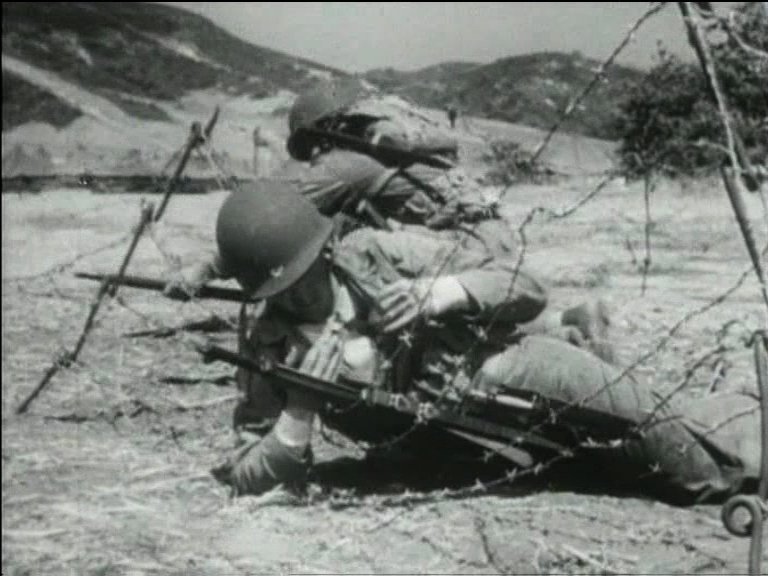 The cycle of moments of "rest" and "departure" in the next-to-last scene of the film GUNG HO!, as we have described it in the previous chapter, encapsulates the general cyclical nature of this war film's effort to mobilize. This cyclical nature can be considered as prototypical for poetics of affect that are designed to mobilize. Their conclusion is also a re-initiation. One is tempted to say that the scenes of recruitment from the beginning protrude into the end of the film, as if it wanted to start again, and so the film protrudes into the space of the contemporary movie theatre audience. As a poetics of affect, GUNG HO! is realized as a cycle that regenerates itself, the cycle of the generation and re-generation of the military corps. Many of the film's pathos scenes are composed as circular structures. The imaginary vertex or zenith of these circles is the moment of a direct, frontal address of both soldiers and the camera. The opening address has already been characterized regarding its static frontality and geometric fixation on the center of the shot, echoing the stasis and frontality of the military address. In terms of imagery, the address is situated by shot composition and camera movement at the intersection of nation and army. The light and dark contrasts on the soldiers and the light and dark patterns of the architectural design of the wall in the background mirror one another and replicate the compositional alignment that converges at a fixed point at the center of the frame. Clip 5: GUNG HO! (Ray Enright, USA 1943), Min. 01:16 - 02:22. "Only those men who are prepared to kill and be killed should apply." 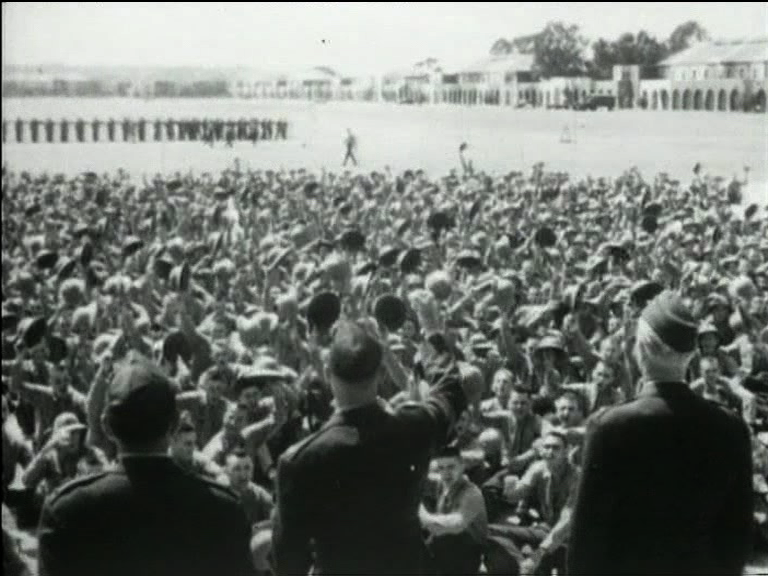 The final scene of the film transforms the images of collective, military triumph into an appeal to a sense of community. 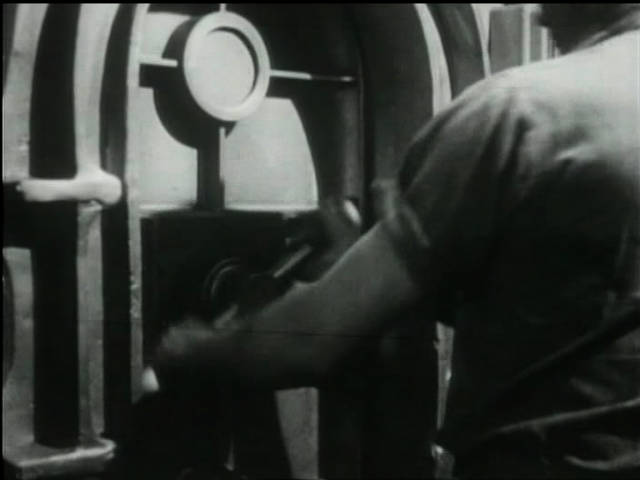 At the center of this audiovisual appeal is a speech aimed directly at the viewer, a plea that is closely connected to the temporal structure of the music. 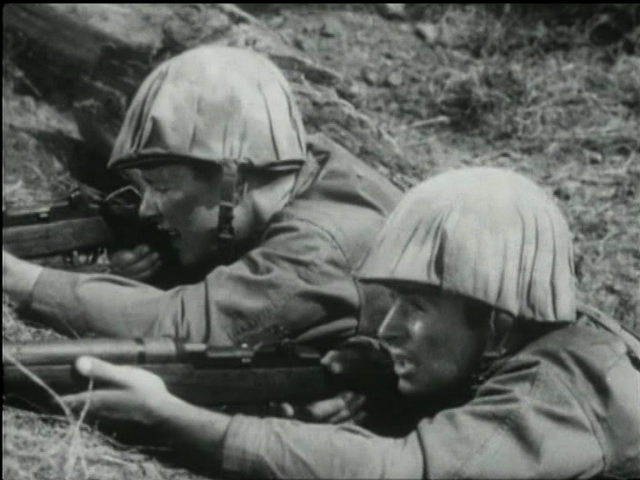 Through the interplay of the shot composition and the sound design the image of readiness for battle is created as an appeal. It is characterized by a dual staging of togetherness. 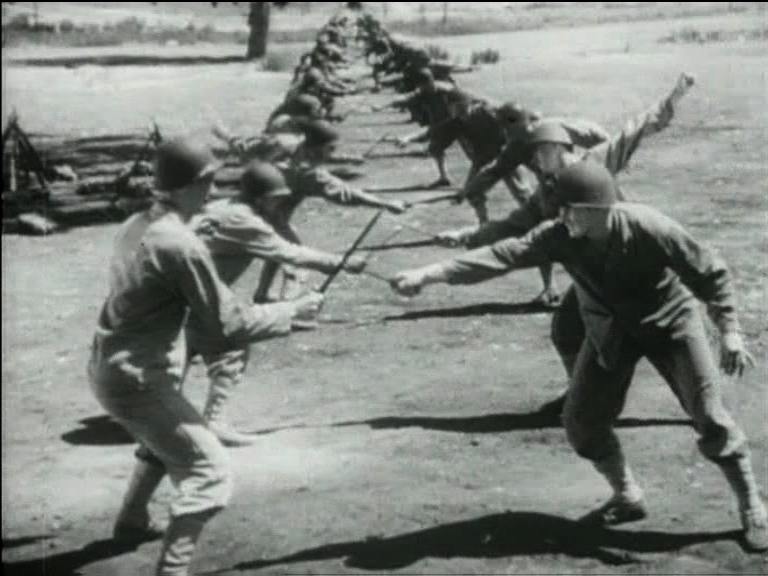 Through a combination of a backward tracking movement of the camera and the choreographed movement of the characters, a tableau is created on the level of shot composition: creating an image of closeness through the framing and the merging of bodies and uniforms as well as it putting the group leader at the center of this arrangement. And the ensuing progression from medium long shot to close-up and back to medium long shot through camera movement stresses the moment of togetherness embedded in the close-up. This movement correlates with the auditory dynamic. At the beginning of the group leader’s speech in medium long shot, harmonious strings begin to play. At the climax of the close-up — the direct address of the camera that makes the contemporary audience the addressees of the speech — a hum is added to the strings that is revealed as singing in the course of the speech. The singing then becomes a full choir at the end of the appeal. This choral song directly connects the verbalized appeal to a form of community that can be experienced sensuously. Clip 6: GUNG HO! (Ray Enright, USA 1943), Min. 80:59 - 82:29. Our approach provides a framework for the systematic analysis of the classic Hollywood war film genre as a poetics of affect modulating the viewer’s emotional involvement. We are also able to perform comparative investigations of the war film genre within a wider historical scope (cf Kappelhoff et al. 2013; Kappelhoff 2016; the articles in this special issue). Experiences of history and memory are made accessible through the poetics of a genre that we described as embodied sensations elicited by the films compositional structures and generic modalities. Films like THEY WERE EXPENDABLE (John Ford, USA 1945) or SANDS OF IWO JIMA (Allan Dwan, USA 1949) shape an experience of history, a shared memory of collective suffering and collective grandeur by shaping and re-arranging the war film’s forms of emotional mobilization, as a contemporary cinema audience has experienced them with films like GUNG HO! 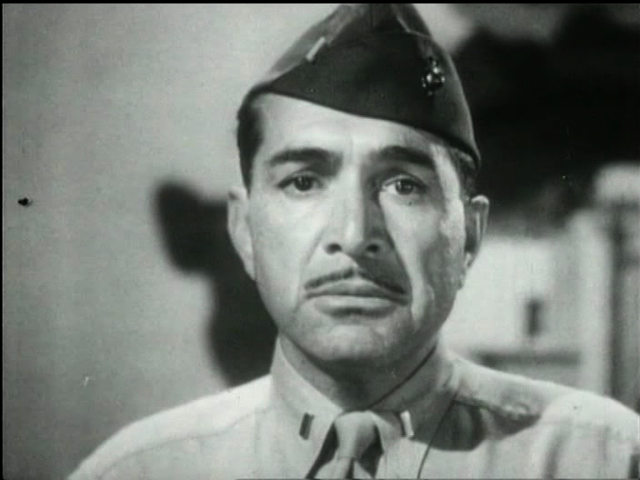 or BATAAN (Tay Garnett, USA 1943). In a similar vein, we can show how the shifts in the relation between the images of later wars in Vietnam or Iraq and the public sphere inscribe themselves in and are shaped by the shifts in the war film genre's poetics of affect. The classic Hollywood war film orchestrated the images of war as an aesthetic experience between rites of initiation, sacrifice and commemoration. It brought forth pathos scenes, narrative stereotypes and audiovisual compositions charged with affective appeals. These aim at the aesthetic pleasure and embodied affectivity of the spectator and the memory of the documents of war at the same time, striving to create a palpable sensation as a sense of community (Kappelhoff 2012). This sense of community is less the content of GUNG HO!’s final address, it is rather the mode of moral, emotional and aesthetic judgments underlying the speech, underlying the poetics of affect traversed by the spectator up to this point in the film. The political, historical and social dimension of the genre is located not in the messages, historical facts or statements but in this sensation and its reconfigurations. As progressions through the pain of parting and the triumphant merging, through fear and omnipotence, through longing and suffering, these films are part and parcel of historical psychosocial economies of affect. Through a systematic method of genre analysis these forms and modalities can be described as experiences of history and memory that merge and express themselves through the images of war in the Hollywood war film genre. Basinger, Jeanine ( 2003) The World War II Combat Film. Anatomy of a Genre. 2nd ed., Middletown: Wesleyan University Press. Dewey, John ( 1980) Art as Experience. New York: Putnam. Eberwein, Robert T. (2010) The Hollywood war film. Chichester: Wiley-Blackwell. Kappelhoff, Hermann (2006) ʻShell shocked face: Einige Überlegungen zur rituellen Funktion des US-amerikanischen Kriegsfilms’, in: Luthor, Nicola; Fischer-Lichte, Erika (eds.) Verklärte Körper. Ästhetiken der Transfiguration. München: Wilhelm Fink Verlag, 69-89. Kappelhoff, Hermann (2012) ʻ»Sense of Community«: Die filmische Komposition eines moralischen Gefühls’, in: Fauth, Søren R.; Krejberg, Kaspar Green; Süselbeck, Jan (eds.) Repräsentationen des Krieges. Emotionalisierungsstrategien in der Literatur und in den audiovisuellen Medien vom 18. bis zum 21. Jahrhundert. Göttingen: Wallstein Verlag, 43-57. Kappelhoff, Hermann (2016, forthcoming) Genre und Gemeinsinn, Hollywood zwischen Krieg und Demokratie. Berlin/New York: De Gruyter. Kappelhoff, Hermann & Jan-Hendrik Bakels (2011) ʻDas Zuschauergefühl. Möglichkeiten qualitativer Medienanalyse’, Zeitschrift für Medienwissenschaft, 5, 2, 78-95. Kappelhoff, Hermann & Cornelia Müller (2011) ʻEmbodied meaning construction. Multimodal metaphor and expressive movement in speech, gesture, and in feature film’, Metaphor and the Social World, 2, 1, 121-153. Kappelhoff, Hermann; David Gaertner, Cilli Pogodda (eds. )(2013) Mobilisierung der Sinne. Der Hollywood-Kriegsfilm zwischen Genrekino und Historie. Berlin: Vorwerk 8. 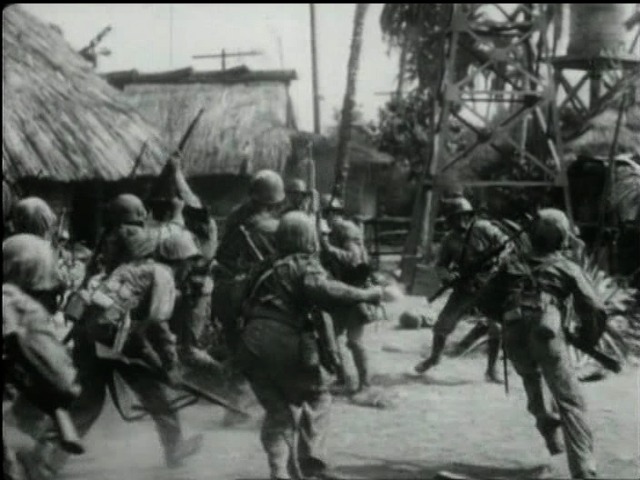 Scene descriptions from the Database "Mobilization of Emotions in War Films", Film: Gung Ho!, authored by Matthias Grotkopp, Franziska Seewald, Michael Lück, Hye-Jeung Chung, Jan-Hendrik Bakels and David Gaertner, http://www.empirische-medienaesthetik.fu-berlin.de/en/emaex-system/affektdatenmatrix/filme/gung_ho/index.html (last access: 2016-04-30). GUNG HO! (Ray Enright, USA 1943), DVD-Quelle: InstantVision Ltd. 2003.